"There are specific styles of upright marble headstones to mark the graves of Civil War Union soldiers and Spanish-American War dead. These historical styles...are inscribed in raised lettering inside a recessed shield...The inscription on the recessed-shield headstone is limited. For Civil War Union and Spanish American War, a shield is inscribed which encompasses the arched name and abbreviated military organization. Because of the special design and historical uniform significance, no emblem of belief or additional inscription may be inscribed. The dates of birth and death are inscribed below the shield." "A special style is also available to mark the graves of Confederate war dead...The inscription on the special style for Civil War Confederate is also limited. The Southern Cross of Honor is automatically inscribed at the top. The name is arched, followed by abbreviated military organization and dates of birth and death." So I was a little surprised to see the stone pictured above. Based on his unit and location, it would appear that James Wiley had been a Confederate soldier. Yet his final resting place bears a military headstone and design usually reserved for those that served the Union. In an attempt to be sure this Mr. Wiley was indeed a Confederate soldier, I did a bit of research. 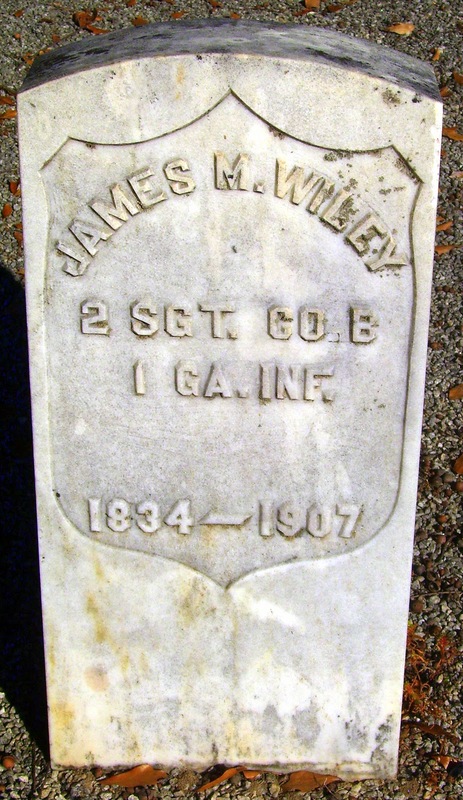 According to Civil War databases on Ancestry and Fold3, there was a James M. Wiley that served as a 2 Sgt in Company B of the 1st (Ramsey's) GA Infantry. This soldier enlisted March 1861 and was discharged with a surgeon's certificate of disability five months later. Less than a month following the release, James M. Wiley enlisted in Company H of the 11th GA Infantry. Though it likely goes without saying, both of these units were part of the Confederate States Army. It seems James M. Wiley, a Confederate veteran, received a Union-styled tombstone. Or did he? Could it be possible this stone is not a true military issue? The birth and death years being inside the shield does seem to contradict the "official" style of the Union stone. The question can also be raised as to when the stone was placed. I suppose whoever chose it might have liked the recessed shield design better. Or is it simply a mistake? What are your thoughts? BTW, Mr. Wiley rests in Snellville Historical Cemetery at Gwinnett County, Georgia. I do not know the final answer as to whether James M. Wiley served with the Confederacy or the Union, but I have seen hundreds of stones like this here in northern Ohio, where many Union soldiers and sailors have been laid to rest! IMHO...I think it is a non-government issue stone. Perhaps someone didn't know the government would supply a marker for Johnny Reb and had their own made. The shield on this stone appears more elongated than the one shown in the sample linked by Dorene in her comment. I just don't think the government would mistakenly put the dates inside the shield after making thousands all alike. Thanks for the great article. I learned a lot! There was a Union regiment raised in north Georgia called the 1st GA - my Ling ancestors belonged to it. I wonder if your man belonged to it also or if someone just assumed he was in the Union unit. Interesting post. I just blogged something similar about the headstone of my own great great grandfather. Apparently someone decided to replace his original stone with a 2nd one which added a Masonic symbol, floral motifs, an inscription "Forever with the Lord" and a recessed shield. Its known beyond any shadow of doubt that he was indeed a Confederate soldier. So it remains a mystery as to why the 2nd stone was placed and why the shield was placed there as a military symbol, or instead somewhat religious as in strength, courage, protection, faith. Another consideration for non government issued headstones as ordered by family members is whether they may have been place during militarily enforced Reconstruction times. Perhaps the Union form of the military shield was the only one available during that time?